Welcome to *what used to be* the 21st stop on the Young Crafters Unite Blog Hop! You should have arrived from the talented Ezlie Perez's blog. 21, eh? I remember those good ol' days of looking forward to buying my first ever six pack! Nowadays, I'm looking forward to finding a good deal on a six pack of boys' socks! My boys and I like to get a bit messy with paper, colors and scissors! Let's just say that I no longer have to use blunt ended scissors and they might be a bit more interested in frogs and mud as of late. Another young crafter recently gifted me with some amazing embossing plates (thank you!) and of course I had to see what they are made of. Using one of my favorite crafting supplies, I gently misted the plate and ran it through some vanilla paper. After cropping the panel to a pretty and interesting work of art, I adhered it to a rusty solid colored base that had been stamped with a sentiment. I then finished the piece with a wrapped a ribbon tab with another of my favorite crafty product, natural burlap string. A rhinestone was the last touch, completing the visual triangle of elements. You're next stop on the hop is Amy Courchaine. There are 65 stops in all and up for grabs are some really great prizes, drawn at random from all commenters on the blog stops through Sunday. You could have the opportunity to a $20 from Simon Says Stamp, your choice of stamp set from Paper Smooches your choice of stamp set from Lawn Fawn. If you by chance get lost, a complete list of blogs can be found here. Fabulous!!! 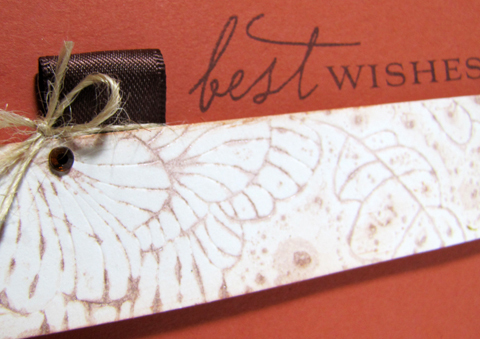 Love the rustic red and the embossed/misted impression plate is great, such a subtle layer, but works perfectly. Love the ribbon tab. Woo hoo. great card, I'll have to look into those plates. Thank you for the inspiration. This is gorgeous! What a great embossing/misting technique. Have a wonderful 4th weekend! love the sliver of embossed paper--very elegant looking card, karen:) happy 4th! Still love stopping by your blog and getting inspired!! What a fabulous card! I love the cluster of elements you made with the ribbon, twine bow and rhinestone =) Thank you so much for joining our bloghop! i don't lean toward those colors, but they are amazing. i'll have to stretch myself. love the ribbon blip and twine, perfect touch. LOVE this Karen! Those colors are fantastic and I love your sprayed strip! Crisp, clean and lovely card! Looks like a card Hallmark would pick up! Love this CAS card Karen and the colors are superb!!! I love the misting technique. It looks watercolor-ish. Beautiful! I love your card and your CAS style!! Simple and sweet ~ nice card! Beautiful card as always Karen. You should do a tutorial on that misting embossing thing. :) hint hint. HA! Beautiful and simple card! TFS! Nice card - love the details! What a great idea for your embossing template Karen. I love the soft texture it creates on your card. This is a simply gorgeous card, love it! I love the card and what a great idea for impression plates. Love how you used the impression plate! And that rustic red is just perfect with the twine and touches of black. This is gorgeous Karen. Love the stamped border and the layout is fab! Oh, I hadn't thought of misting an impression plate! What a cool technique and a lovely effect. Love the rust color, too! beautiful card. thanks for inspiration. 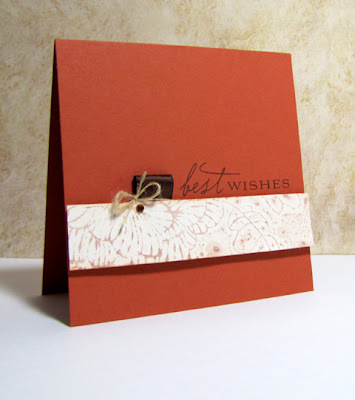 This is a lovely card, the colors are so earthy!! Love the idea of misting the embossing plate. I had no doubt you would work magic with your new embossing plates- but this is even more amazing than I could have imagined! so beautiful- must try the mist! a perfect simple graphic card but still very elegant. such an elegant cas card! Very pretty. I love this rust color and how it takes center stage. Like the CAS layout too! You have such a delightful creative style to your cardmaking! I just love your sweet simple designs. You are amazing! Such a beautiful card, Karen. I'm a huge admirer of your work! Very nice card. You do great work! Love you classy elegand card Karen, it's beautiful. This is really beautiful and elegant! Really fabulous! I love the embossed piece. I usually do things square and plum. I need to push myself to do angles! Thank you for sharing with us. such a beautiful design. love that you misted the embossing plate. i'll have to try that. and really love how you used the ribbon tab. beautiful card, Karen! hope you have have a lovely long weekend! Such a pretty card Karen. Love the clean style. That embossing plate is pretty! Love that impression plate - it's one of my faves!! great job! I will have to try misting and embossing. Ohhh what a fabulous CAS card, gorgeous colours too! I love the idea of misting and then embossing the focal piece. So cool! I'm going to have to try that. Thank you so much for joining us on the Young Crafters Unite blog hop! Oh, wow! I'm a now a new subscriber. Love your style. So clean and fresh. Very nice--I like the ribbon tab and burlap string. Very nice. I like your card. Karen, I really like your style. This card is beautiful! The design of this card is DIVINE! Gorgeous!